Happy Wednesday everyone, how is your week so far? Today, I want to introduce you this amazing website __ www.signomatic.com . 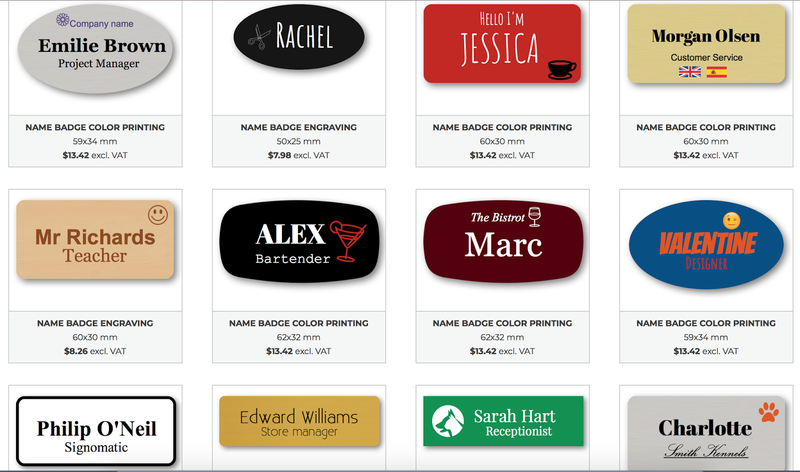 This is the place where you can customize and order your own name badge signs like these ones here __ www.signomatic.com/name-badge-signs, roll-ups (perfect for exhibitions and other displays), banners, magnetic signs, office signs, decals, plastic and wood signs, and more. Wether you own your shop and want to get customized signs for the door or windows, or you want name badge on your office door, maybe you just want some motivational quotes in your home office space, or you need some fabulous decoration for your car windows, you can all do in one place at www.signomatic.com. It's very easy to design your own product. You just have to go to the Design Page. First, choose __ you want to design your own name badge, vinyl text, decal, banner, roll-ups, magnetic sign or something else. Then, you get the option to choose a size, shape, border and color of your product and add to basket. You're all set. It's that's simple. Below are a few examples of Name Badges. If, for some reason, you don't want to design your product from scratch, meaning on Design Page, you can always choose one of their ready-made signs and adapt it to your requirements. One of the best parts about this customizing process is that you can upload your own images. Just keep in mind that the images should be high resolution. Have you customized anything for yourself yet? Let me know in the comments below. Wish you all a wonderful rest of the week. I loooved this idea and to get to know it, I never thought of doing that, but why not! Thank you so much for the idea, I will check out their page for sure! I hope you have a great week! This is such a brilliant concept, Nina! Sounds awesome, love this idea! I have looked on websites like these and I must say, they can randomise som of the most amazing logos! But I've always created my own logo for my blog. For my interior design work, I've asked a friend who is a graphic designer to do it for me ;-) I wanted that to look that little more profesh! Thanks for sharing this site with us, girl! It's good to know of sites like this that offer this kind of service. I hope you're having a great week so far! Thanks for sharing this cool site! Great site! I've used similar sites to make custom stickers and labels for work! That sounds like a good site. I'll have to check it out. This is really cool- thanks for sharing! This such an cool concept! Love it!